Today marks the first of three days that our ESA group will spend on a field trip of a portion of France’s northern coastline. We made our first stop at a sheep farm/bed and breakfast by the coast. We didn’t see any sheep, but we could see our next stop in the distance: Mont St. Michel. 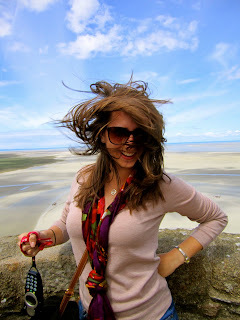 Mont St. Michel is undeniably beautiful. It was definitely worth weaving through the cramped, winding streets flooded with bodies and shops as well as the multiple flights of stairs leading to the entrance for the view alone. Our visit took place during low tide, but we were told that the tide is apt to rise with speed comparable to that of running horses. Nonetheless it was astonishing. Not so astonishing was the fact that I lost my second pair of sunglasses thus far while taking pictures in the monastery. First Versailles now Mont St. Michel… I guess maybe my subconscious wants me to be Gretel while in Europe? Later, we were informed that the Normandy area was the birthplace of crepes so, naturally, I stopped to grab one. As we departed, we learned that the hostel we were to stay in that night was vandalized so we were going to spend the next two nights elsewhere: Bayeaux. We stayed in Bayeaux’s finest: The Three Pommes- a 2 star motel. #winning. Dinner, a couple bottles of wine, and the unintentional uprooting of an entire swing set helped everyone warm up to our accommodations. It was a touch windy.